After losing both his legs in a bomb explosion in Afghanistan in 2009, Special Forces soldier Damien Thomlinson was determined not only to survive, but to meet life head on. By all medical accounts he should have been dead, but he fought back against his injuries with perseverance, strength and a true Aussie larrikin spirit. Within six weeks of his accident, Thomlinson was standing on two new prosthetic legs, and later went on to complete the gruelling Kokoda Track. Damien’s story has been featured on 60 Minutes, Sunday Night, Sunrise, Studio 10 and more. In 2013 he released his autobiography ‘Without Warning:A Soldier’s Extraordinary Journey’, now a bestseller, and in 2014 here presented Australia at the inaugural Invictus Games in London. 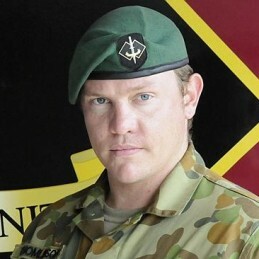 Damien uses his public profile to raise awareness and funds for the families offallen and injured, and is the national ambassador for the RSL ANZAC AppealMinute of Silence campaign. Today Damien is one of Australia’s most prolific and inspiring public speakers, with his experiences, irresistibly positive attitude and passion for life inspiring people of all ages. He has spoken at events for a wide range of leading clients, including the Commonwealth Bank, Holden, Optus, LEGO, CGU, Suncorp and many more.